When the temperature drops and the snow starts to come down, you need a vehicle that has the capability to keep you safe on the road and get you to your destination. At Silver Star Motors, we offer a selection of SUVs that are rugged enough to handle the Canadian winter while still providing every luxurious appointment you’d expect from a Mercedes-Benz. With multiple advances designed for premium performance on difficult terrain, the Mercedes-Benz lineup of SUVs are a great choice for discerning Montréal drivers. Vehicles like the GLE400, equipped with 4MATIC® all-wheel drive, are designed to give you confidence and control on any road in any season. 4MATIC® is always working to optimize torque for each individual wheel, and integrates Mercedes’ own Electronic Stability Program (ESP®) to maximize effectiveness in slippery conditions. The 4-wheel Electronic Traction System (4-ETS®) monitors every wheel and at the first sign of slipping responds to direct torque to the wheels with the best grip so you’ll always have outstanding traction. And with systems like Collision Prevention Assist Plus® the AMG® GLA45 is actively working to keep you and all of your passengers safe by monitoring other vehicles on the road and ensuring a safe following distance. 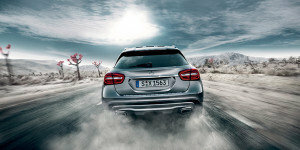 While the winter temperatures continue to drop you’ll stay cozy and warm inside the cabin of any one of Mercedes’ SUVs. Dual-zone automatic climate control in the GLA250 allows you and your passenger to precisely customize the air temperature to your comfort, while the heated seats in the GLE300D 4MATIC® take the chill off of even the coldest day. Montréal drivers can select from three different warming levels that level off to maintain warmth without overheating. To warm up even quicker, you can even opt for a heated steering wheel; a heating element under the Nappa leather-wrapped steering wheel quickly brings the wheel to a comfortable temperature to keep your hands toasty. If you’re looking for a luxury SUV that’s ready to brave the fierce winter weather, visit Silver Star Motors to explore the full line of winter-ready Mercedes-Benz vehicles. Located at 7800 Décarie Boulevard in Montréal, contact us at (888) 856-0285 to schedule your test drive.